OLHZN-10 was the tenth high altitude weather balloon flight for Overlook Horizon High Altitude Balloons. This flight launched on March 21, 2018 at 4:00pm ET (20:00 UTC). The focus of this flight was to test our new miniature Arduino Pro Mini radio tracking system. This new micro-system is intended to allow us more flexibility for future flights. We intend to use this system for multiple purposes due to it’s inexpensive nature. We’ll be using it for standalone flights when the chances of recovery may be small and also as a backup secondary tracking system on-board our larger regular flights. This flight did not utilize any of our Lightdow LD4000 cameras and strictly focused just on the radio tracking systems. The launch procedures proceeded normally for the preparation of OLHZN-10. Our checklist and countdown procedures appeared to be timed appropriately to have adequate time for the preparations and launching on time. Launch occurred at exactly 4:00pm EDT after battling some heavy gusty winds just seconds before liftoff. The flight proceeded normally and the radio tracking system was accurately reporting it’s position with no anomalies to report. The flight proceeded through the coldest part of the troposphere and survived the super low temperatures that reached as low as -55°F at an altitude of 33,595 FT. The flight then proceeded to burst at approximately 65,000 FT. The highest recorded altitude was 64,388 FT., although altitude reports for the micro-payload were occurring on 90 second intervals so a slightly higher altitude is likely in between transmissions. Our larger payload flights record altitude readings every 1 second to an on-board SD card, which this payload does not have. 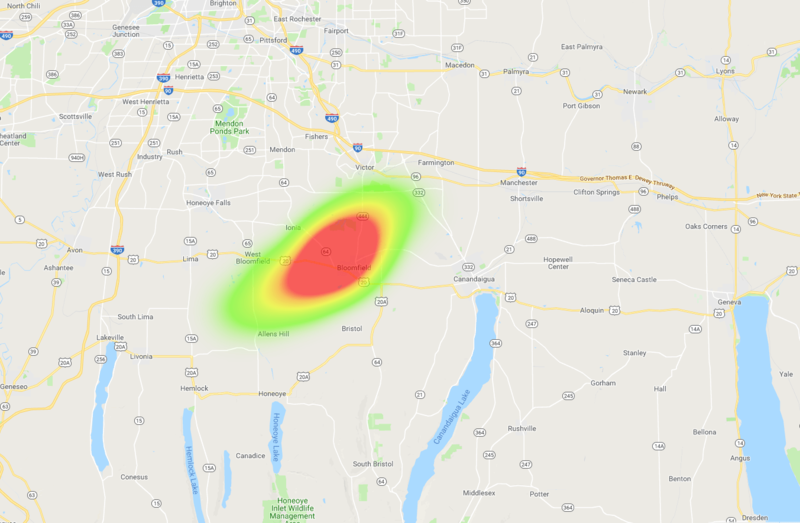 After balloon burst, we received 1 final radio transmission that reported a lower altitude (63,568 FT.), a 3mb increase in pressure and a 20°F drop in temperature down to -47°F. These reading indicated that balloon burst had occurred and that the payload was now descending. Sadly, no further radio transmissions were received after this. Likely, the completely exposed payload suffered from rapid cooling causing the Energizer Lithium Ultimate AA Batteries to “brown out” and not be able to provide enough power to the flight computer. It was discovered on OLHZN-11 that the wire antenna being used for the flight was too rigid and would snap off during descent. OLHZN-12 will implement flexible guitar wire to resolve this. The payload is expected to have landed in a 3.75 square mile area that is only about 4.5 miles from the launch site. This would make this flight the shortest downrange landing ever achieved by us, but without a confirmed recovery we cannot officially call the record. Although the flight was not recovered, extensive data was collected during the ascent phase of the flight and allowed us to test numerous systems and post-flight analysis processes so partial success was still achievable. This payload will fly again with some minor modifications. The payload does contain a label with contact information so we’re still hopeful that someone may find it someday. We’ll be testing this again on the next flight. This is the first flight of our micro-tracking system. 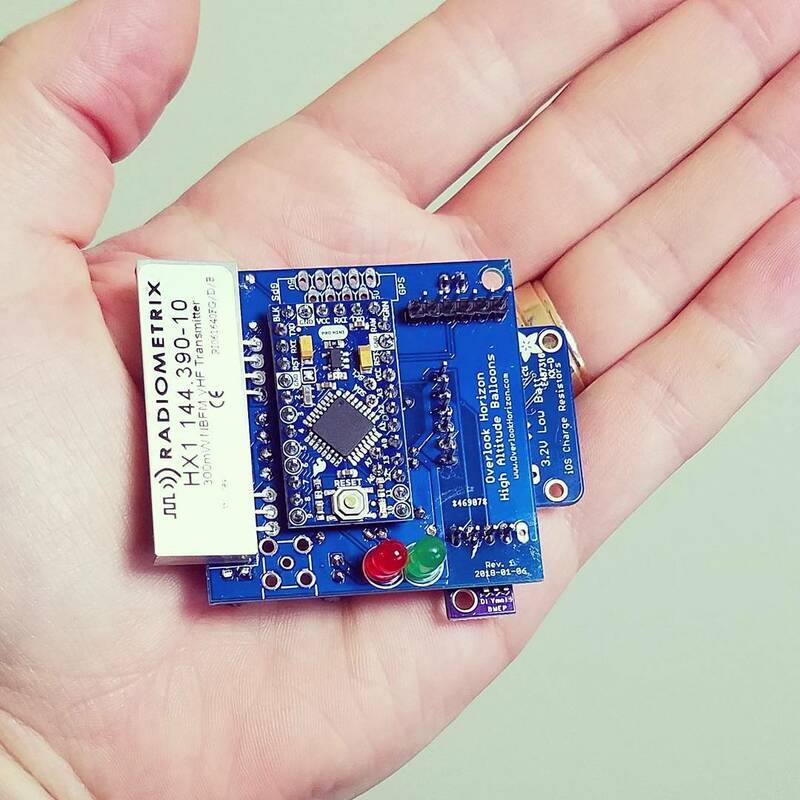 It utilizes a 3.3V Arduino Pro Mini as the main tracking system along with a BME280 for collecting pressure, temperature and humidity data. This micro-tracker only weighs 100g which is only 6% of the weight of our regular fully loaded payload. It will utilize a much smaller balloon (200g) and a much smaller parachute (18″) to allow for experimentation on ascent and descent rates. The manufacturer for this tiny parachute doesn’t publish descent rate tables so we’re uncertain on the actual descent speed that we’ll achieve. The payload will certainly fall slow enough to be safe, but the main concern would be the payload descending too slowly and drifting for a long distance. At only 100g, the balloon remnants alone will cause enough drag to slow down the payload, but the parachute provides extra caution, but hopefully not too much. This flight used a much small 200g balloon and was only expected to reach an altitude of around 73,000 FT. As there were no cameras on-board this flight, the maximum altitude wasn’t much of a concern for us. Primarily, we were interested in testing the radio tracking systems to ensure they operate as expected. The burst ended up occurring early at just over 64,000 FT. The highest altitude recorded was 64,388 FT, however, this micro-payload only relays altitude readings every 90 seconds which is much different than our larger flights that record altitude readings every 1 second to an onboard SD card. Since there is a 90 second gap between the highest reading and the next descending reading, the payload likely achieved an altitude closer to 65,000 FT. at its peak. The lowest temperature recorded was -55°f which was measured at 33,595 FT. in altitude at the upper edge of the troposphere. The payload was also expected to reach super low temperatures during the descent phase, but the payload stopped transmitting during the descent so no further readings were received. The super cold temperatures reached during descent were a likely reason for the payload failure during the descent. 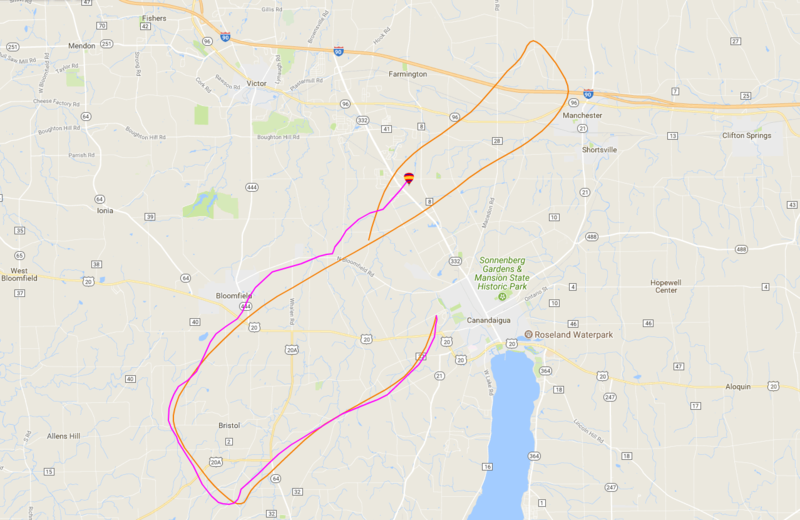 The actual flight path for this flight (pink) followed very closely to our final flight path prediction (orange) that was made a few hours prior to the launch. This accurate prediction helps give us confidence in our flight prediction methods and has also helped us narrow the search radius down for the payload to just a 3.75 square miles. At 2400 acres, it’s still a very large area to cover, but maybe someone will find it some day. The actual path was recorded up until just a few seconds after balloon burst and the balloon icon indicates it’s last known position. The balloon was expected to continue following the shape presented in the orange predicted flight path. 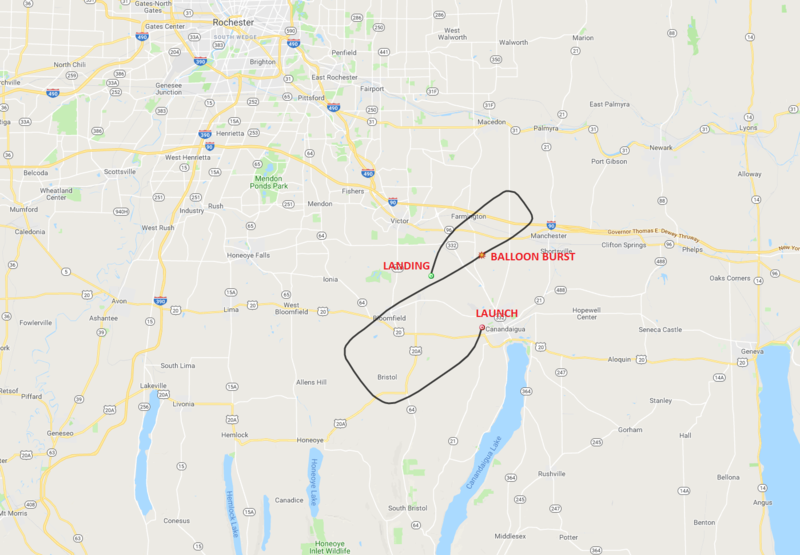 The balloon did burst earlier than expected so this would shift the predicted landing to the Northwest of the predicted landing shown just slightly. One of the main goals of this flight was to refine our post-flight data analysis operations so that we could quickly generate useful weather data from our flights. Although this flight has yet to be recovered, it was able to measure the entire ascent operation and send back extremely valuable data for us to be able to test and refine our post-flight data analysis. 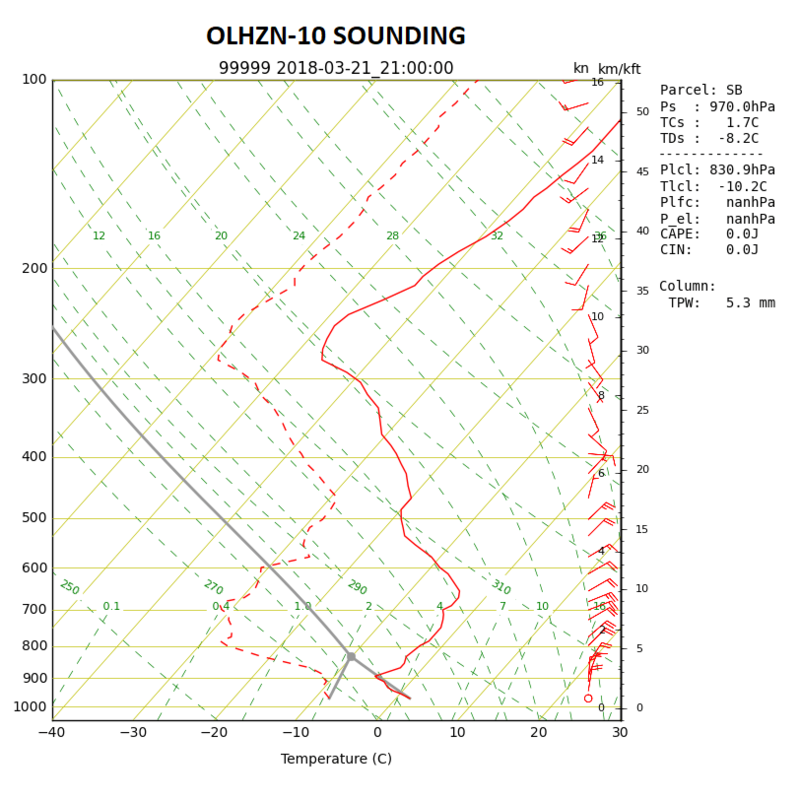 On future flights, we’ll now be able to quickly generate sounding files in the same format provided by UWYO and also be able to quickly generate Skew-T log-P graphs for sharing the atmospheric conditions present during our flights. Our data is visualized on this Skew-T log-P diagram. You can also download a copy of our sounding file here. These were the final flight path predictions that were submitted to the FAA. The last prediction put the landing zone about 4.4 miles from our launch site which means that this flight has the potential to break our minimum downrange recovery distance record, although it has not been recovered so we cannot say for sure. Our current shortest downrange recovery record is 5.01 miles from OLHZN-8. Target Burst Altitude: 73,123 ft.
Target Helium Volume: 23 cu ft.